All proceeds will go toward the Bruce Trail Conservancy’s program to secure, protect and maintain a continuous conservation corridor containing the Trail along the Niagara Escarpment. Supply is limited. First come – first served! When: 10 a.m. to 4 p.m. every Saturday and Sunday in December, beginning Saturday, December 1st (2018) while supplies last. Come and warm your hands by the bonfire while you sip on some warm apple cider – our thank you for your support! 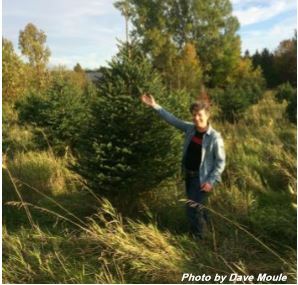 Our 2017 annual Christmas Tree sales at Hockleycrest Farm raised over $3,600. Many thanks to the volunteers who came out to make seasonal baskets and wreaths; to the volunteers who prune the trees each summer; to Jenna Nensi for donating her handmade signs for us to sell; to Fred Somerville for donating some precut trees and wreaths to sell; to all the volunteers who came out to help sell the trees and to Sally Cohen and Dave Moule for hosting this incredible fundraiser each year. Without them this venture would not be possible. Our biggest thanks of course is saved for last and goes to everyone who visited Hockleycrest Farm in December helping us raise over $3600, resulting in our most successful year yet!